Thanks in no small part to the passionate campaign waged by you, my esteemed readers of Spitalfields Life, The Marquis of Lansdowne is saved. Yesterday, I asked “How can it be that a museum which exists to protect our heritage wants to use public funds to destroy an historic building?” The jaw-dropping irony of this situation was not lost upon the members of Hackney Council Planning Committee who were unconvinced by the Geffrye Museum’s scheme involving the demolition of The Marquis of Lansdowne, rejecting it outright by six votes to two. Consequently, the Geffrye has lost its Heritage Lottery funding for the development and has no choice but to go back to the drawing board, recognising that any future proposal needs to include the restoration of The Marquis of Lansdowne. “I am aware that there is a prejudice against concrete,” exclaimed architect Sir David Chipperfield, in bewildered disbelief at the tide of events. 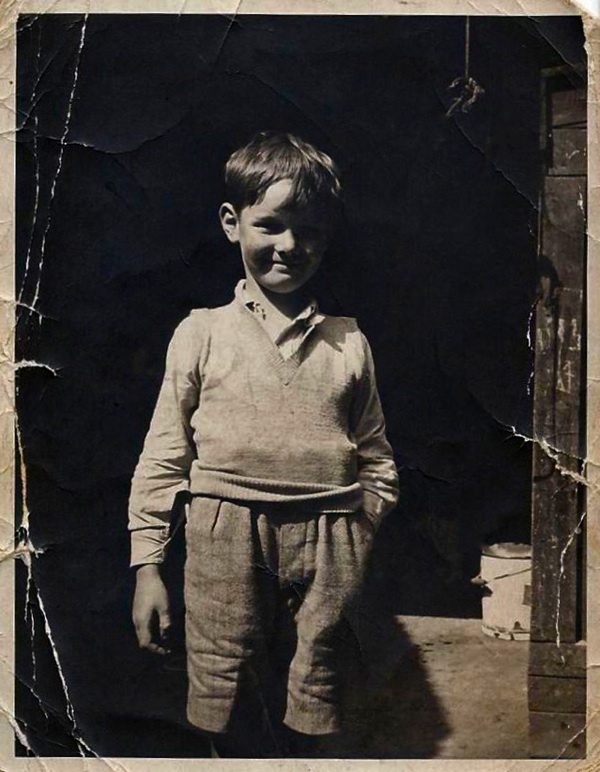 Celebrating this glorious May Day success which grants a future to The Marquis of Lansdowne, I am republishing the story of George Barker who was born there in 1931 and whose family ran the pub from before 1915 until after World War II. The Marquis of Lansdowne is the only old building left on Cremer St, yet it contains the history of the people who have been there for the last two centuries, their culture, their society and their industry. 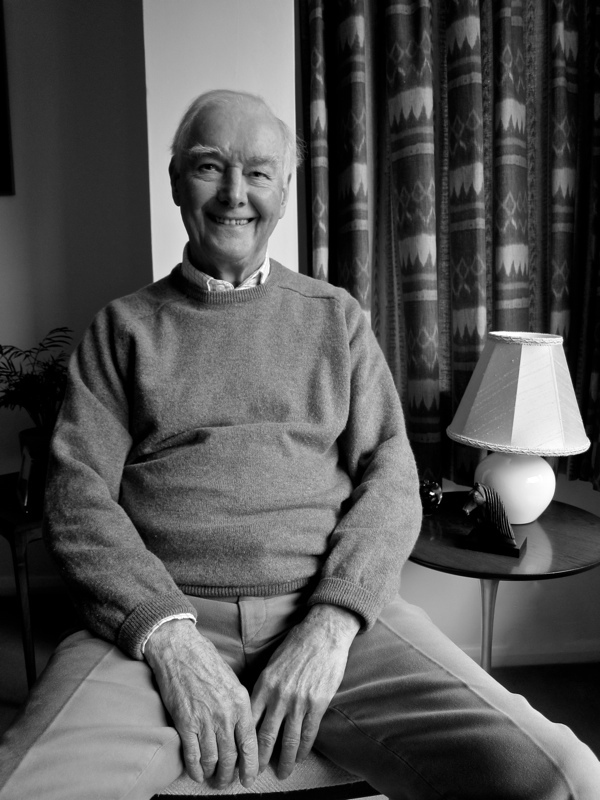 For George Barker, born in the upper room of the pub in 1931, it was his family home, spanning three generations of Barkers – his grandfather William who came from a village in East Anglia at the end of the nineteenth century, his mother Lilian who ran the pub alone through the war and opened up every day during the Blitz, and lastly himself, the one who got a grammar school education and a Masters degree in Maths and has lived for the last fifty years in a beautiful house in Chorleywood. No infamous killer took his victim to The Marquis of Lansdowne for her last drink. Charles Dickens did not visit The Marquis of Lansdowne and base a character in one of his novels upon a local eccentric discovered propping up the bar. In fact, the story of The Marquis of Lansdowne is a more important one that either of these, it is that of the working people who lived in the surrounding streets, for whom it was the centre of their community and meeting place for their extended families. In this sense, it is a quintessential East End pub and the history of this place cannot be told without reference to these people. 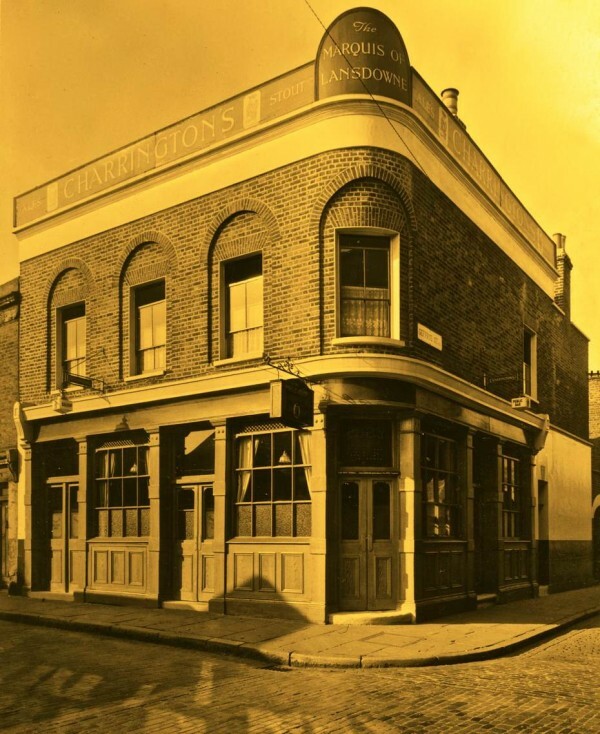 Haggerston has changed almost beyond recognition in recent decades and, all this time, The Marquis of Lansdowne has remained as the lone sentinel of a lost world. Yet when I met George Barker and he told me the story of his family and the life they led there, he brought that world alive. “My earliest memory is of being a kid playing on the street, everybody played on the street in those days. A couple of times, I went into the Geffrye Museum and we collected caterpillars in the gardens. They used to have a playground with swings and a place to play football at the back of the museum. I was born at The Marquis of Lansdowne in February 1931, but my family’s involvement with the pub goes back to the beginning of the century. 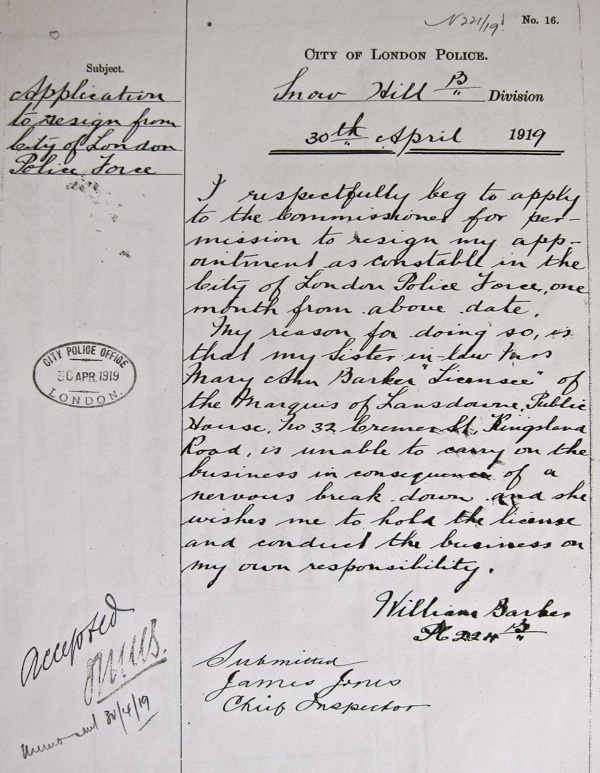 My grandfather William George Barker told me that the Barker family came from a group of villages near Ipswich, moving to Hoxton at the end of the nineteenth century. He came to London in 1899 and worked as a barman for year in the East End before becoming a policeman for twenty years. Frederick Daniel Barker, my grandfather’s brother, was licensee of The Marquis of Lansdowne until he died of TB in 1919, when my grandfather took it over from Frederick’s wife Mary Ann. Then, when my grandfather died in the thirties, my father George Stanley Barker took it over until he died in 1937 when my mother Lily ran it. She remarried in 1939 and, as Lilian Edith Trendall, she held the license until 1954 when her husband Frederick Trendall took over after her death. I think they all made a living but it wasn’t a terribly easy life. We had a side bar and then another one on the corner we called the darts bar, as well as the front bar and the saloon bar. Even then, there were redundant doors which meant that at one time the pub was divided up into more bars. The saloon bar had upholstered bench seats and bar stools, but the other bars just had wooden benches with Victorian marble-topped tables. The curved bar itself was in the centre, spanning all the divisions with a tall central construction for display of spirits and optics, and the beer pumps were in the front bar. I remember, as you came in the side door from Geffrye St, the wall had a large decorative painted panel advertising Charrington’s Beer and there were mirrors at the rear. The pub windows were of etched and cut glass, and above the main door was an illuminated panel with the words ‘Toby Beer.’ It was a Charrington pub and a wagon came with dray horses to deliver once a week from the brewery in Mile End. Further down Cremer St was the Flying Scud, a Truman’s pub, and the Star & Pack, a Whitbread pub. On the Geffrye St side of the building was a kitchen which was – in effect – where we all lived, and an office. Above the kitchen was my bedroom, with a window looking onto Geffrye St and the railway arches. On the first floor at the corner was the front room where we didn’t go very often, and the main bedroom – where I was born – was on Cremer St, divided from the front room by a construction of wooden panels, as if it once had been one big room. All the arches were coal depots in those days. It was brought by railway every morning at six thirty and all the coal men would be filling sacks, and bringing their horses and wagons to carry it away. But it never woke me up though, because I got used to it. In those days, on one side of the pub was a terrace of houses and on the other there were three shops. I remember Mrs Lane who ran the sweet shop next door and Mrs Stanley who had a cats’ meat shop where they sold horsemeat. In the thirties, there was a couple of fellows making springs for prams in the building across the road which became a garage in the nineteen forties. I recall there was a baker’s on the other side of the street too and H.Lee, a big furniture manufacturer, on the corner of the Kingsland Rd. My mother, Lily, ran The Marquis of Lansdowne singled-handed through World War II. It was heavily bombed in the surrounding streets and, when there were raids, she took shelter in the spirit cellar which had been reinforced with stanchions. She had grown up in the area, and most people knew her and she knew them, and they had been to school together. She was quite an outgoing woman who enjoyed a bit of banter and a lot of chat with the customers. She was the daughter of James Wilson who ran the scrap iron yard opposite across Cremer St under a couple of arches. He started the business there and he had a place in Tottenham, so he left his three sons to run it. There was a friendly community on our doorstep, she ran the pub and her three brothers ran the scrap iron business across the road, and there was another uncle called Harmsworth who had another two arches where he ran a furniture business – one of my aunts married him. All my uncles and aunts lived within about one hundred yards of each other. They were the Barkers, the Wilsons and the Cheeks. A Barker married a Wilson and then a Wilson married a Cheek and then a Cheek married a Barker. My mother had another three children with my stepfather in the forties, and we all lived together in the Marquis of Lansdowne. 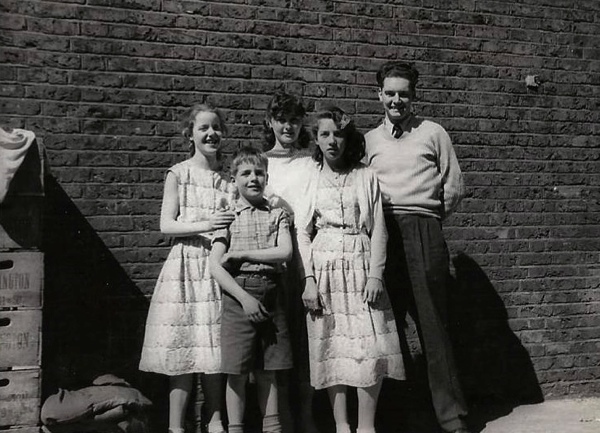 There was me and my sister Eileen, plus the twins Maureen and Christine, and their younger brother Freddie. At the age of eight, I was evacuated during the Blitz, but when I came back it was still quite dangerous so I went to stay with an aunt in Kensal Green. I never lost contact because I cycled over at weekends and moved back at the end of the war when I was thirteen. In the fifties, the business started to drift away. People didn’t have much money and television came along, so it could be quiet on week nights but it was always busy at weekends, and for celebrations like VE Day and the Coronation we got a special licence and opened from midday until midnight. Even if people had moved away, they came back for Saturday evenings to meet with their relatives and friends. I would be serving behind the bar – probably a little younger than I should have been – and by the age of eighteen I was regularly working there. I always looked after the place when they went in holiday. My mother died in 1954 and my stepfather took over the pub. I studied for a Masters Degree in Maths at Woolwich Polytechnic and I was away from 1954-56 doing National Service. In 1957, I left The Marquis of Lansdowne forever – I was working for Hawker Aircraft in Langley by then. I only went back occasionally after that, not too often. As people moved out, it started dwindling away and I think my stepfather sold it to a family called Freeland who had been coalmen under the arches and then he moved away too. George Barker was born in the bedroom facing onto Cremer St, indicated by the window on the left. At The Marquis of Lansdowne, 1957. George Barker on right, aged twenty-five, with sister Eileen, centre back. The other three are his half-brothers and sisters from his mother Lilian’s second marriage to Frederick Trendall. The twin girls are Maureen on the left and Christine on right, with their brother Freddie between them. 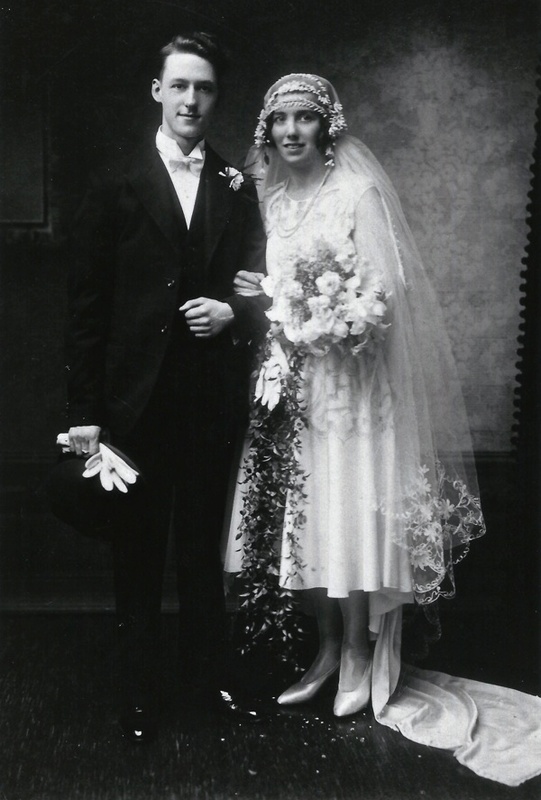 George Stanley Barker & Lilian Edith Wilson, married at St Leonards, Shoreditch on 7th September 1929. Lilian ran the pub after the death of her husband in 1937 until she died in 1954. 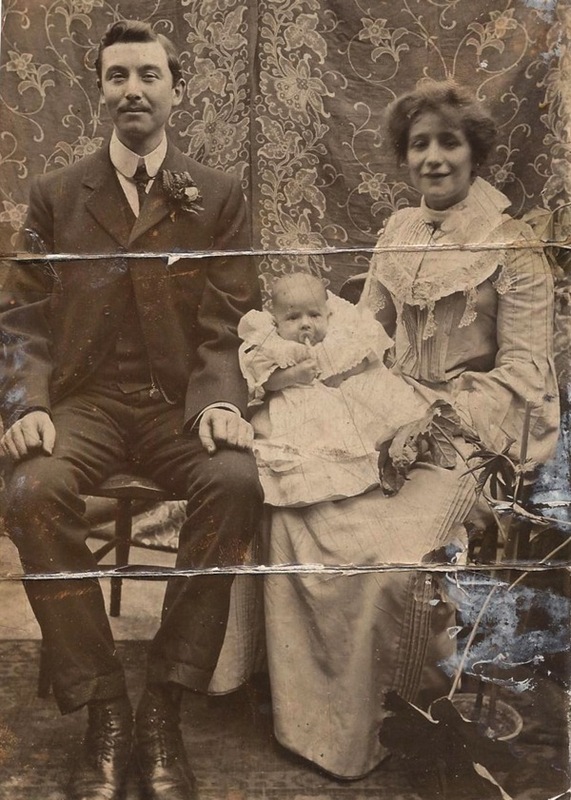 Ex-policeman William George Barker who ran The Marquis of Lansdowne from 1919 – photographed in 191o, with his wife Annie Susannah Oakenfold and son George Stanley Barker, who took over from his father and ran the pub until 1937. 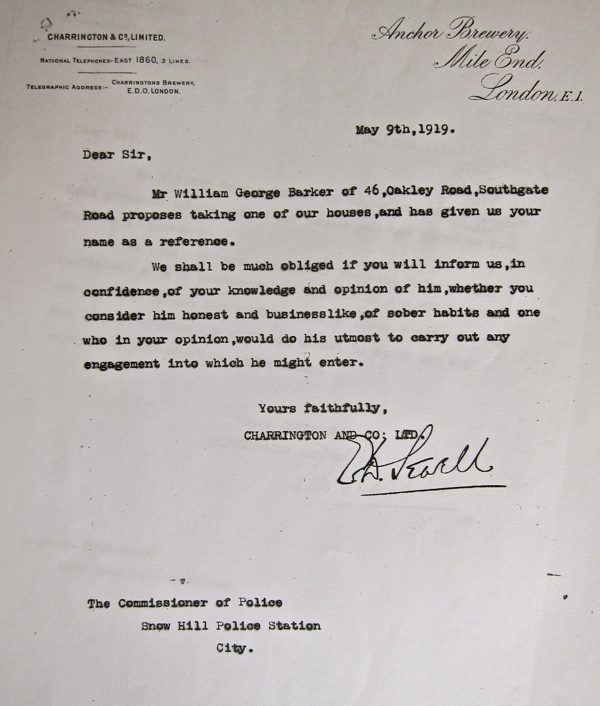 May 9th 1919, Charrington’s, Anchor Brewery, Mile End, seeks a reference for William George Barker from the Commissioner of Police at Snow Hill. 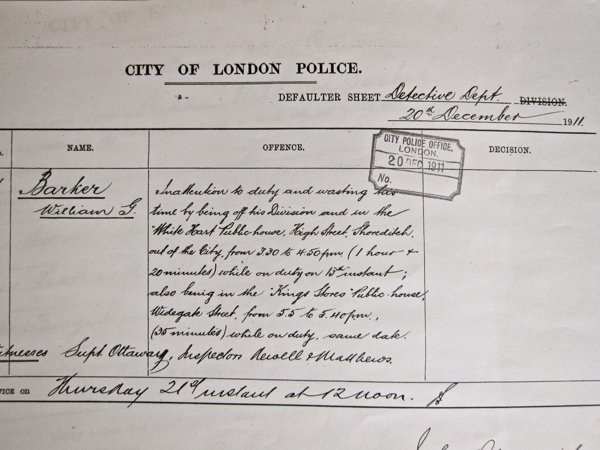 Presumably, the incidents of Christmas 1911 were discreetly forgotten. Dating from the Regency era, The Marquis of Lansdowne is the only old building left on Cremer St.
Three Huzzahs!!! Best May Day celebration. Wonderful wonderful news!!!! Wish I were there to celebrate! I am aware there is prejudice against stupidity. There is joy in the land! I hope we have the same outcome here in New York City. The Museum of Modern Art purchased the former home of the Museum of American Folk Art and plans to tear it down. The building is only 12 years old and was planned to partner with the architecture of MOMA which dominates the block. Imagine! a museum tearing down another museum. I hope American preservationists hear of the success of the effort to save The Marquis of Lansdowne and take heart. Fabulous news! Well done to everyone who campaigned and signed the petition. i’m still stunned by the revolting remarks of the person who runs the museum, suitable immortalized ON A TEA TOWEL. jeez. Thank goodness common sense prevailed! Let’s hope a move forward will seek to preserve what is left, not just of this neighbourhood, but others threatened as well. A step in the right direction, so very happy to read this decision. Wow. Great news. Power to the people. Thanks to the GA and Spitalfields lifers! Perhaps a new Director will set the Geffrye Museum on a more inspirational direction. Well done to everyone involved in saving this important building. It really lifts my heart that there are so many others out there that really do care for our heritage, even if it is of the “labouring classes”..
Yessssssssss. Well done all of you who worked so hard to bring this about. Saw the news on Facebook early this morning – excellent!! So pleased it’s been saved – thanks to everyone concerned. What wonder ul news. Obviously the architect’s comment “I am aware there is a prejudice against concrete” shows that there was total lack of understanding and sympathy towards the local environment where this pub stands. It is the only old building left on the street, and by preserving it we will continue to develop the wonderful eclectic mix of style that is the trademark of this great city. Modern (concrete) architecture has its place too, but should be a companion to, and not a total replacement of, traditional buildings. 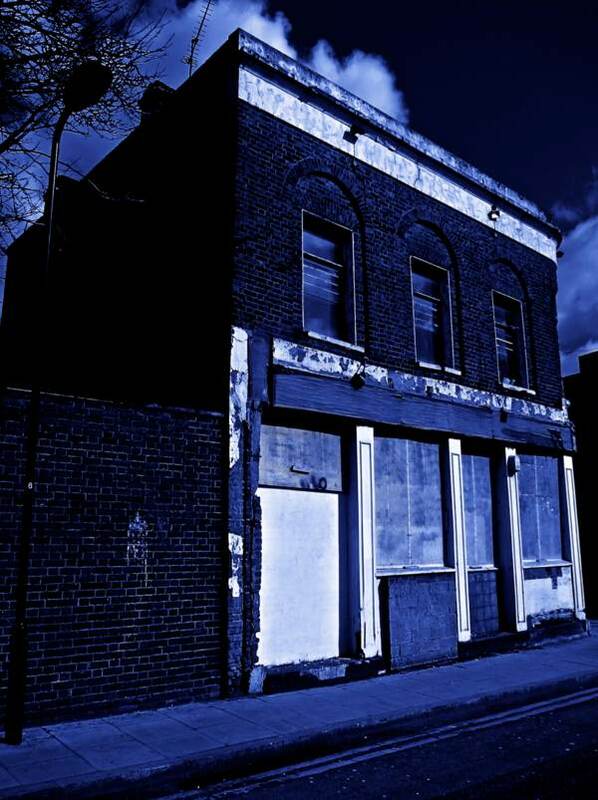 What a complete lack of imagination by the director and architects – this pub could be restored to provide a real experience of local history – think of Wilton’s Music Hall – instead of yet another clone of a soulless corporate cafeteria! Absolutely fantastic news. I really thought that common sense would be overruled by bureaucracy and madness which, sadly, appears to be the norm when it comes to destroying the historic East End. Well done GA! The pen really is mightier than the sword. Wonderful news, it just shows what people power can do – many of them no doubt of the “labouring classes” – even from as far afield as the States and here in Australia. Congratulations to all those – led by the Gentle Author – who have achieved this return to sanity and congratulations to those in Hackney Council who also saw the light! Hurrah! Common sense prevails at last. The voice of reason was heard. Well done campaigners! Chipperfield is wrong – it’s not a matter of ‘a prejudice against concrete’, but rather a prejudice against unwarrented demolition of the small remains of our heritage. A shame that it’s just a job to him, but I’m sure with his experience he could do a better one with the building in hand, and if not him, plenty of others would try to come up with something better. Hurrah! Well done gentle author for your rallying cry. Imagine – it could still be there in 200 years and imagine how even more special it will be then. Very good news – The Marquess will be a brilliant addition to the Museum, lucky for them and for us all it has been saved. Well done GA! ‘I am aware there is a prejudice against concrete’ – surely this should be offered up to the Guiness Book of Records for the most apposite sentence spoken by a developer, to date, in the present century. Well done fellow Spitlefielders. Any thing else need saving Gentle Author? We are just getting our second wind. so good to know these things can be achieved! This is brilliant news – well done the Gentle Author and all campaigners! Can’t quite believe it – overjoyed with the decision of the planning committee. right direction but I look forward to my first drink at the bar!! Congratulations! What a fantastic victory for local life and history. It is so nice to read for once that a historical part of our neighbourhood was saved. Too many times local protest is overruled. 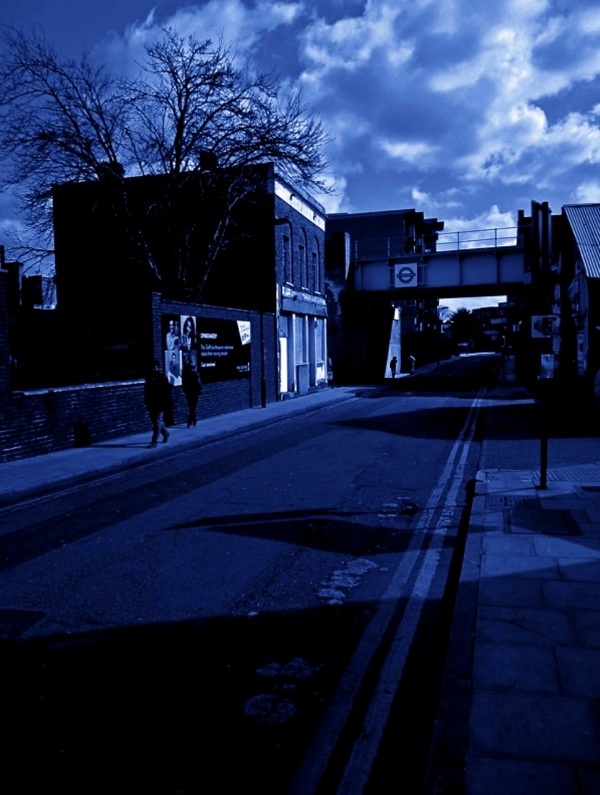 The magical historical East End is disappearing around us. Thank you Gentle Author. This proves yet again just how important your work is. Keep it up! Brilliant! I am so pleased and proud to have played a small part in saving this historic building. The Geffrye do not deserve to have it! I certainly look at them and their museum in a different light now. Hurrah for the labouring classes! That’s brilliant news. I signed the petition and it’s heartening to see that petitions do sometimes work. A triumph of good sense. Let’s hope the Geffrye Museum do restore the Marquis to its former glory. On another note: didn’t people have lovely handwriting back in the day? An excellent result and thanks for your fine work in bringing this to the attention of Londoners. Hopefully the building won’t stay empty and will become a proper pub once again. Great News – let’s hope it is restored to how it looked 60 years ago and then what an attraction it will be. It will be interesting to see future plans. Wonderful news! A victory for heritage and “the labouring classes!” And your own active role in the campaign to save The Marquis of Landsdowne should be applauded. Fortune – in one sense of the word. Or one might say, “Victory, this is your victory”. Really cheering news and a great victory! Wonderful work by you gentle author and hugely influential on your wide readership. It’s been great to read people’s comments and be aware of their participation and strength in this campaign. I note Jerry W’s warning comment however indicating that there may be a lot more work to come. So…a luta continua! Fantastic news! Well done everyone who fought for this. What a wonderful victory. ……and lets also congratulate the Hackney Council members who responded so magniificently on this occasion. Fantastic news! Thank goodness there is still some recognition that old buildings need preservation in this City. Three cheers for the Lansdowne – due in no small part to you Gentle Author for alerting people to what would have been an architectural disaster. There are far too many concrete monoliths in this City as it is. My Grandmother was a Harmsworth and my Dad worked at Spitalfields market. This has got me thinking. Such cheering news for a glorious, sunny day. Congratulations to all who opposed the Geffrye’s frankly extraordinary scheme and fingers crossed for another great local pub. Hip Hip Hooray !!! commonsense prevailed to save this historical building. Lets hope it’s soon restored for future generations to enjoy – imagine a ghastly concrete box next to The Geffrye – doesn’t bear thinking about how out of keeping this would have looked. Well done everyone. This news has brightened up an already sunny day in Watford. My ancestors in Shap Street would have been particularly pleased. My first thought was – Three cheers!!! Superb news for those in your area. How anyone who’s studied Architecture could think a concrete “box” a piece of artistic work is beyond me. Imagine streetscapes filled with such boxes. this has exposed a great deal in how these things work, thereby educating the public to be more aware the next time they see it happening – and that thoughtful objection and considered campaigning actually work! Shame about all the wasted time and money, but if that’s what it takes.. so they actually have to redevelop the pub now? I can’t really see the Geffrye running a pub, so would they sell/rent the building? I bet there will be one heck of a party in there tonight. Wish I was close enough to attend. nice news with which to start the day in Cambridge (Massachusetts)! I might add that David Chipperfield has done beautiful work. I’m looking for example at his Am Kupfergarten 10 in Berlin (among Museums and Galleries at his website), which adjoins (and quasi-incorporates) neighboring older buildings. Why the astonishing tone-deafness in this instance? I trust that the ultimate result will be very nice. Brilliant news. A very special victory for the East End and grateful thanks to those who stood up to the imperiousness of the owner/developers. The phrases ‘no interest in the labouring classes’ and ‘a prejudice against concrete’ are not only patronising, they are offensive. We just want to save our historic buildings and see them reused – as opposed to being destroyed for the profit of a handful of generally non-East Enders. If the Geffrye do take this to appeal, or to Mayor Boris Johnson, as Spitalfields Market’s London Fruit and Wool Exchange and Mickey’s Shelter has been, then they will be making a dreadful mistake. Let the decision stand and let this be a new beginning for East End built heritage. The Marquis of Lansdowne can lead the way – English Heritage, look, listen and please list the London Fruit and Wool Exchange. From a friend across the sea, so happy for you all, congratulations. Next trip hope to have a pint at the new and improved Marquis of Lansdowne!! fantastic, pleased as punch… what a gin and tonic to hear sense prevailing for a change. To the friend who suggested David Chipperfield Architects. The plight of buildings such as The Marquis of Lansdowne is sealed if they are the best on offer. I didn’t “suggest” David Chipperfield, they appear (or do I misread the article?) to be the firm hired by the Geffrye Museum. I gather, from looking at images of their projects to date, that they could do well in this case too. I’ve just logged on expecting the worst. What a surprise – I take my hat off to the planning committee that saw common sense and were not bowed by financial considerations. But we need to keep watch for any future applications that seek to do anything other than a full restoration of the Marquis. Happy day, indeed! Maybe I’m too cynical (my family don’t call me The Voice of Doom for nothing) but I was so sure there would be bad news. So imagine how delighted I am to be proved wrong. This is just such Good News, that common sense has prevailed. I went to work with a smile on my face! Now the new plans, when they are published, must be scrutinised to ensure that the restoration doesn’t become subject to any grudges that certain people might hold. I am a fan of the museum, but not now its director, and intend to visit when the work has finished because the pub is MORE of a draw than a featureless concrete box might be. Congratulations on all your campaigning being successful. Well done to TGA for highlighting the plight of this building and to all those active local campaigners who have rallied to the cause. A victory indeed! -Thank God for common sense. It’s brilliant news of course, but can the focus now be on lobbying the Geffrye to use it to tell all the stories they currently ignore – as outlined in the GA’s columns? We need more Geffrye museum to house these displaced histories…. I know who deserves the first pint when it’s pulled…….well done TGA ! As the Geffrye is dedicated to the history of furniture why not open a new chapter. Make the Marquis a section dealing with the history of public house furnishings and fittings over the ages with the history of brewing, spirit manufacture and pub signage. So very happy to hear it! I will make a point of visiting it when I visit the UK! A wonderful decision. Well done to everyone who campaigned for this and to Hackney Council for their enlightened decision. I hope that there will be no appeal, and that whatever happens to the Marquis will be a fitting restoration, and a tribute to all those ironmongers who lived in the Geffrye Almshouses and undoubtedly visited the Marquis for a sociable drink. Congratulations from San Diego! I signed the petition and have been following the story – as a Londoner abroad, I am SO happy that a little piece of my city is preserved. Thank you!! Congratulations to G.A.and by extension Adam Dant. What a great broadside, Adam, and thanks to efforts of the G. A. in his fabulous daily reporting, that the Marquis Pub is saved. I have visited the Geffrye Museum on visits to London, and I always thought that its mission was to highlight and preserve not only the social and aesthetic history of domestic culture, but also to preserve the heritage of the buildings and neighborhood in which it resides. The almshouses, which comprise the bulk of the current museum, are a testament to the care and consideration, while perhaps not perfect, of a community to its neighbourhood and residents. Thank goodness common sense has prevailed and an area steeped in history has been spared another concrete box. I was so sure it was lost, I can hardly believe it, fantastic news! Happy day! So heartwarming when common sense wins the day. My great-grandparents ran a spit and sawdust pub but they are part of all our heritage. We just need a role for pubs in today’s world so they become and hub of the community again. A real heart-gladdening Triumph. Well done Gentle Author and who those who fought the good fight. You get so used to the fat cats always winning that a Victory like this seems almost incredible. Very heartening indeed! Chipperfields, we understand, have proven themselves very capable of sensitively blending new building designs with existing old ones. But, as David Dewing, Director of the Geffrey pointed out at the recent public meeting – Chipperfields were working to the instructions of their client. Who knows what Chipperfields would have designed for the site, given a freer hand. What arguments were there around the table over the last three years that we were not privy to? Maybe they battled hard to keep the pub, use softer materials, blend the old with the new …….. or have Chipperfields just lost their way? Amazing to read so many supportive comments! Well done to everyone. Good to see that this protest & the outcome actually made the national press today. It was in today’s copy of the ‘I’ the mini Independent. Even you got a mention GA. Fantastic news. You richly deserve a pat on the back. So many lovely buildings are swept away without a second thought these days. I will have a warm glow every day I go past the Marquis on the DLR. I still can’t believe the Geffrye Museum were planning to do this. Shocking. Wonderful that for once a mad planing application has been overruled and common sense has prevailed . Hurray for the good sense of the councillors but more particularly congratulations to TGA for flagging it up and employing the gentle art of persuasion so effectively . Restores faith and great cause for celebration . Fantastic news !! When the pub does open, perhaps its name could be corrected – it should, of course, be the Marquess of Lansdowne, not the Marquis. This is good news and demonstrates the power of collection action and use of social media as a positive tool to facilitate that. It is ironic when you have cultural organisations behaving almost like aggressive commercial entities in their quest to expand. For example, the Whitechapel Art Gallery’s take over and ultimate destruction of the old Whitechapel Library. Another fabulously human story reinforcing the life of our very great city. Thks.